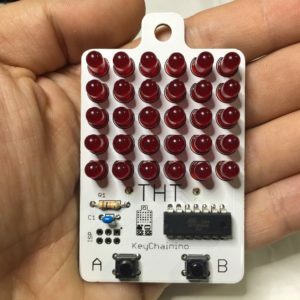 Making a Game for KeyChainino is really easy. To prove that, I decided to realize a tutorial to design the WALLED game step by step in a really easy way. The goal of this game is to move the “man” (a dot) inside the walls’s gates that coming down from the top of the screen. Every Game made for KeyChainino always starts with the same structure. Download the basic structure here. 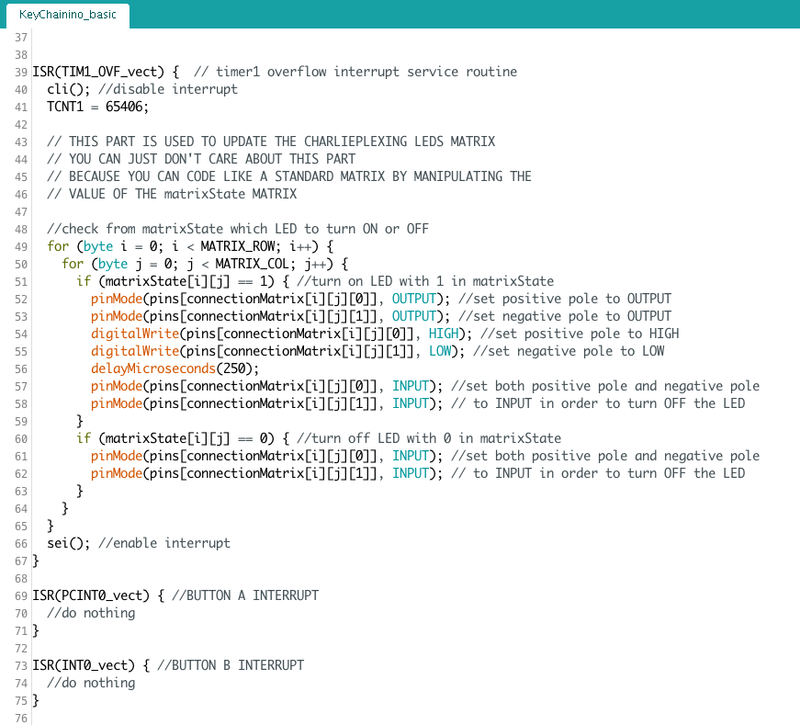 The first #include lines are used to include all the AVR function that we use for enable interrupts, programem, sleep and power libraries. The other #define lines combines a number to a word and describes the number of ROW and COL, the number of Pins used for Charlieplexing and the pins used for the two Buttons. Next we have the variable pins[PIN_NUMBER] that contains the pins used for the Charlieplexing. We have the connectionMatrix[MATRIX_ROW][MATRIX_COL] which describes the connection of each LED with the corresponding pins for Anode and Cathode. The first value inside the inner braces is the Anode, the second value is the Cathode for each LED. At the end we have the matrixState[MATRIX_ROW][MATRIX_COL] used to really change the states of the LEDs by changing its corresponding bits. Here we have the interrupts routines. 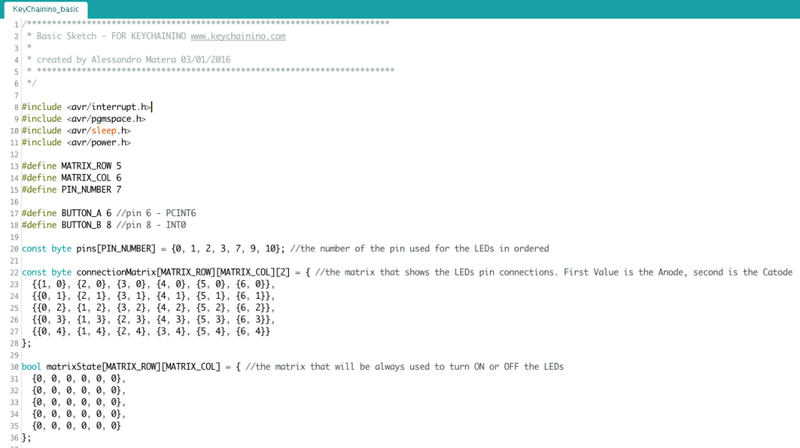 the ISR(TIM1_OVF_vect) is used to update the Charlieplexing Matrix according to the matrixState array. the ISR(PCINT0_vect) and the ISR(INT0_vect) actually don’t do nothing inside their functions. But it’s important to put them in the sketch otherwise the two interrupts, used to wake up the microcontroller after it goes to sleep, won’t works. 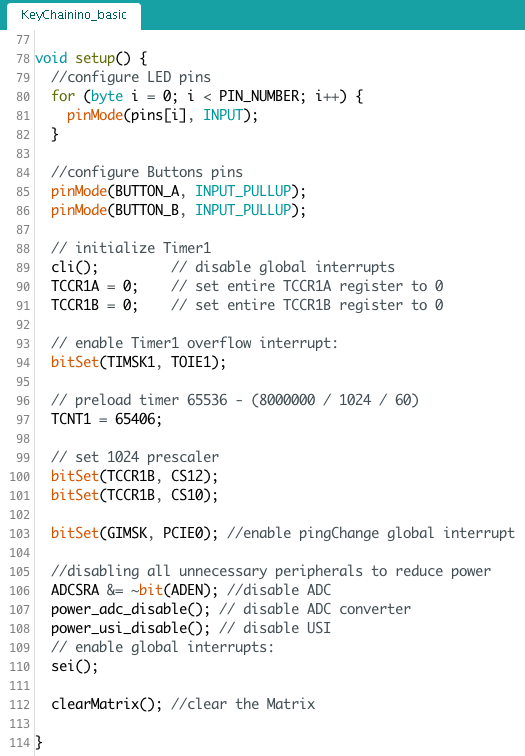 Know more about Charlieplexing and Timer1 overflow interrupt here. Well, now we have the setup() function where we setup all the pins used for the charlieplexing and the buttons. Next we setup the timer overflow interrupt and the button interrupts. After that we disable all the unnecessary peripherals to reduce power consuming. The loop() function actually don’t do anything. 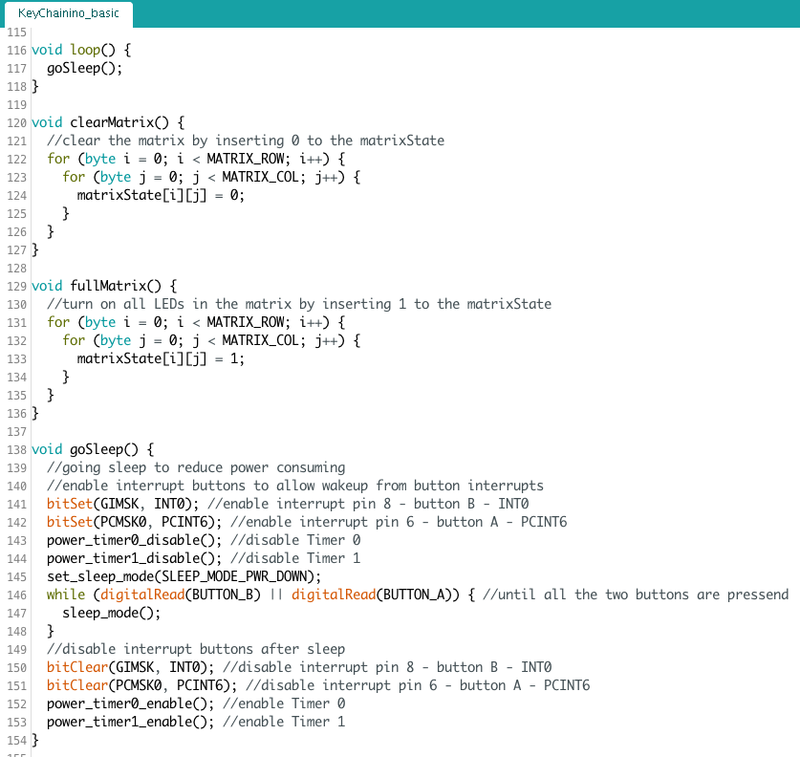 It only puts the microcontroller in sleep mode with the goSleep() function. This function – goSleep() – actually enables the interrupt for the two buttons, disables the timers to reduce power and put the micro in sleep mode. Until the two buttons aren’t pressed at the same time, the microcontroller remains in sleep mode. When we press the two button at the same time, the function disable the two buttons interrupts and re-enable the two timers. Now we can start to build our man, the dot used to go inside the wall’s gates. 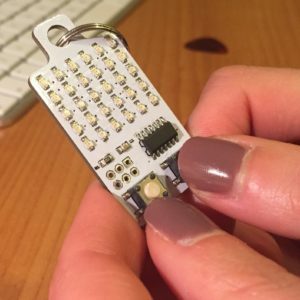 The other two functions – clearMatrix() and fullMatrix() – are used to put all the bits of the matrixState – and so the LEDs – to zero and one in oder. The man is a dot that runs on the bottom lines of the LEDs matrix. To move the man to the left or to the right, we use the two buttons. Insert this variable at the top of the sketch, after the matrixState declaration. This variable indicates the X position – so the COL position – of the man. Now we can write a function that allows us to move the man. In this function first we store the actual x position of the man in the variable manXNewPosition. After that we check if a button is pressed. If it is, depends on which button is pressed, we increase – go right – or decrese – go left – the manXNewPosition. Next we check if the manXNewPosition variable exceeds the field game limits. So if we are over the MATRIX_COL – 1 we set the variable back to MATRIX_COL – 1. We use “MATRIX_COL – 1” because MATRIX_COL it’s egual to 6 because we have 6 columns. But our first column is at 0 (zero) position. The same story for the ROWs. Well, after fix the manXNewPosition variable, we can really show the man by turning on the LEDs with the matrixState. First we check if the man position was changed. If it is we refresh its position by clear its previous position – by putting the corresponding position in the matrixState array to zero – and then we set its new position – by putting the corresponding position in the matrixState array to one. Otherwise, if the man is still in the same position, we do nothing to avoid annoying flickers. Now we need to call this function inside the loop() function in order to call this function every time. Ok, now if we upload the sketch to KeyChainino we can see the man and we can move it to the left or to the right. If you don’t know how to upload the sketch to KeyChainino, check this guide. In the updateManPosition() function, we check the buttons states to move the man. This parts is used to move the man to the right. You certainly noticed that we check the button’s state twice. This method is called “software debounce” and is used to check if the button is really pressed. Learn more here. The delay that we have inserted actually determines the button sensibility. We can create a variable to change this sensibility in a easily way. Now try to change the keySensibility variable to another values and try what happens to the man’s movement! That’s the end of this first part of the tutorial. If you want download the complete sketch of this first tutorial part here. In the second part we start to build the walls.